Bring 1 cup water to a boil in medium saucepan. Stir in rice. Bring water to a boil again. Reduce heat to low; cover and simmer 5 minutes. Remove from heat. Stir rice; cover again. Let stand 5 minutes or until water is absorbed and rice is tender. Fluff with fork; set aside. Meanwhile, place asparagus in large bowl. Core tomatoes over a separate bowl to catch juice. Dice tomatoes, reserving juice. 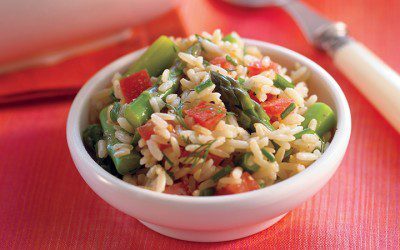 Add tomatoes to asparagus. Whisk 1 1/2 tablespoons reserved tomato juice, lemon juice, oil, salt, and pepper in small bowl until well blended. Stir in chives and dill. Add rice to salad bowl. Pour in dressing; toss lightly to coat. Variation: To turn this salad into a heartier main dish, add 1 cup chopped cooked chicken breast. Exchanges per serving: 1 1/2 Bread/Starch.